2016 is knocking at our doorsteps. It is that time of the year when businesses are planning and strategising for the next year, drawing up their goals, objectives and plans to achieve the same. As a restaurant owner, you are likely to be doing the same. A critical element in your planning process is information about what your customers are looking for. You want to be in the know about the trends in food behaviour that will help you come up with the winning combinations of tastes and ingredients. You need to have the insights and the inspirations that will keep you in tune with the times and in the forefront of food innovations. In order to help you plan better, you want to understand how the tastes and food preferences of your consumers are changing. This post from Greenroom does just that for you! In order to help you deliver what you promise, your business also needs a trusted partner who can understand your needs and requirements. How about someone who can help you save time and money in different aspects of your business? How about if you had someone who could look after the non-food aspects of your business while you focussed on your core competency? Alsco is there for you. 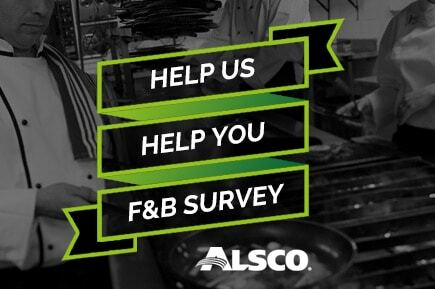 You can help Alsco understand the changing trends in the requirements of the food and beverage sector in order to help serve you better. A couple of minutes today will help Alsco get to know the opportunities and challenges you face. This knowledge will help us design products and services that will save you time and effort, many times over, each single day. What Food Trends Does 2016 Predict? Mintel, a global market research agency has released its top predictions for 2016. Here is what they predict. It wasn’t too long ago when a vegetarian person in a restaurant had to look at the very end of the menu to find an odd dish (or maybe two) to select from. However, that reality has changed and changed pretty fast. There is a huge improvement in the quality and selection of vegetarian and vegan food available on menus. This shift is a direct result of the growing demand and popularity of such food. The number of people turning completely vegetarian is on the rise as is the number of people who while they continue to eat meat, want to either reduce its consumption or are attracted to vegetarian food because of its quality and taste and would like different options too. Menu items which are full of processed foods are getting replaced with natural foods. Natural unprocessed foods like fruits and vegetables have not lost their essential nutrients be they vitamins, minerals or fibres which disappear during the processing of foods. Restaurant menus, which make people want to buy natural foods are becoming a common sight. These items are being given attractive labelling such as ‘Chef’s Recommendation’ or being drawn attention to attractive graphics, images or by placing them in strategic eye-catching positions on the menu. Food sources from sustainable sources is a growing trend in restaurants and is being appreciated by their patrons. In fact, this has been a top trend for foods and menu for a few years now. Chef’s increasing use local produce grown within a certain distance of the restaurant or at least within the state. Taking this a step further is the trend of hyper local produce, which is using produce grown on the premises itself. ability is by using products which are certified as ‘responsibly-sourced’ such as free range chickens. Food is no longer just a means to satisfy our daily calorie requirement. Increasingly, people are turning to specific food substances which help keep the body fit, the mind active, your heart healthy or help achieve a glowing skin. From the benefits of green tea, raw foods, berries or brown rice, food is more than a means of getting our daily nutritional value. As people move along in an exercise program, their requirement for food groups varies. Initially, the objective may be to reduce calories, later they may need to build muscle and protein consumption may take centre-stage. Also, different kinds of exercise programs have their own food requirements depending on whether you are aiming for total body strength or aiming to beef up your body. Origin of products is increasingly acquiring centre-stage and becoming important for both consumers and chefs. This has an impact on the labelling of foods. With the new Green and Gold Kangaroo Labelling system, Australians have the opportunity to work out exactly how much of their food is Australian. Dieters are now being assigned a diet based on their genes and the sequences coded within those genes i.e. in their DNA. Studies have shown that diets based on their DNA are 33 percent more effective than those based on just counting calories. People are assigned one of five plans based on the lab findings of their DIY swab test. The plans include which foods to eat and what exercises to follow based upon what your body will respond to best. This has continued to grow in popularity and gain importance. We are living in the age of the Millenials, the younger, tech-savvy generation who are heavily engaged with the social media. According to estimates, the Millenials, typically between 15 and 35, comprise roughly one-third of the global population. Quoting from Greenroom article on food trends for 2015, ‘Using social media to connect with customers has become imperative. According to Social Hospitality.com, almost all restaurants will be on Facebook within the next couple of years and four in every five will be on Twitter. Practicing portion control is the key to eating healthy. Downsizing to healthy portions assists the body in downsizing to a healthy size too. It is important that the portions served are right for a person. People tend to eat more if larger portions are served. There is increasing awareness about the types of fat. Unsaturated fats are gaining acceptance while saturated fats typically found in animals are disappearing from the shelves and pantries. Products like low fat dairy, poultry, fish and nuts are gaining popularity while red meats etc. are losing theirs. If there is one thing that needs to be done after you have cooked your food perfectly, is to present it nicely. The way the food is plated could enhance or mar the appetite for the food. It is no wonder then that chefs lay so much emphasis on appearance.